I'm thinking that the recording (me getting tired towards the end aside - more remarks about this later in this post) issues are related to (again - my lack of experience with the recording device) me setting up the mic really close to myself (so I could easily reach the buttons) and - thus - the recording level peaking out when playing soft, and staying at the same level when playing loud. I actually ~did~ the gradual crescendo - as well as the most significant portion of the crescendo on the sustained pitch - but the dynamics didn't seem to make it on to the recording. 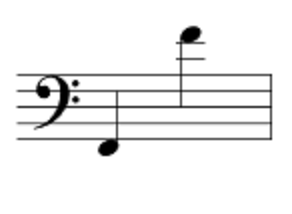 - 1-and-2 plays the G overtone series just fine (after all). - the only real issue(s) is some needed classic flat 5th partial work-arounds. That having been said, the open D is not the least bit flat, and the C# could "go either way". 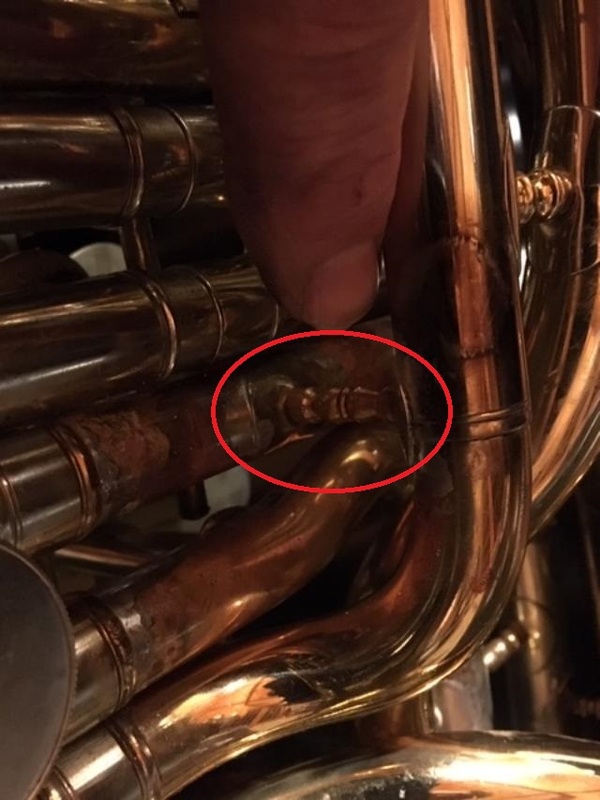 The two pitches that call for either lipping or alternates are the B and C.
- good, but not as good as offered by my Willson 2900...but the reason that (after all these years) I've not sold this PARTICULAR Willson 2900 (pocketed the profit, and bought myself a good Chinese euphonium) is BECAUSE of its (better than any other Willson or any other euphonium I've played) crazy-strong/easy low range...which helps me cover bass trombone parts (church gigs / quintet lit.) with that instrument. 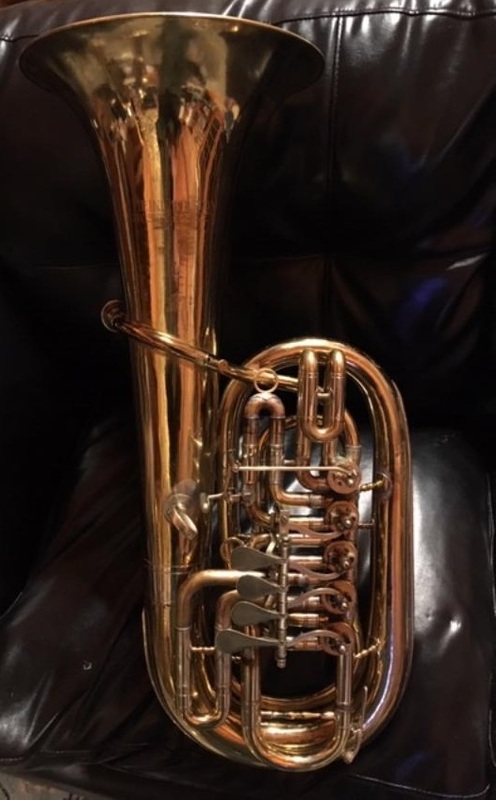 All-in-all, the low range on this "bariton/tenor tuba" is equal in response to the low range on most all other "euphoniums" I've ever played. 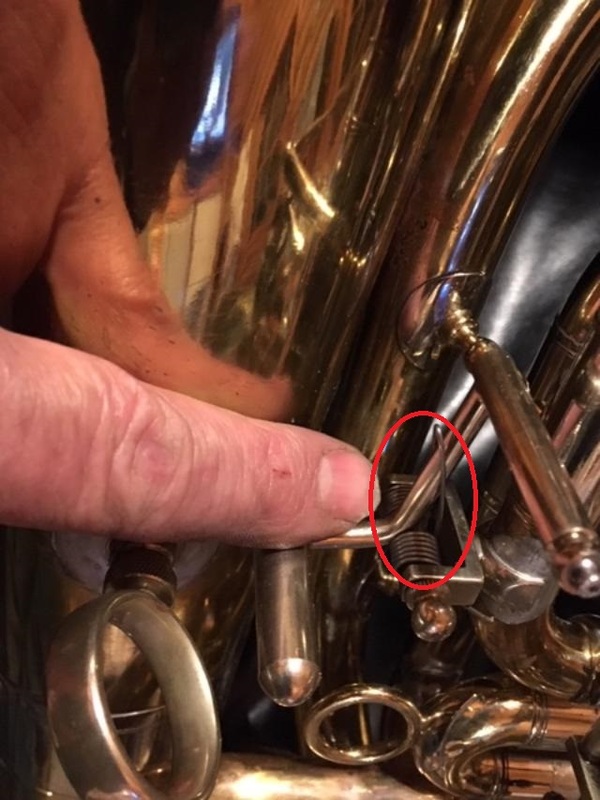 - I've been using a "miniature Helleberg" (bass trombone size) mouthpiece that I developed years ago, but Dave never put into production. Also, a good friend sent me a gigantic Wick bass trombone mouthpiece (similar thin rim to my "miniature Helleberg") which is quite "blown out" (large inside). 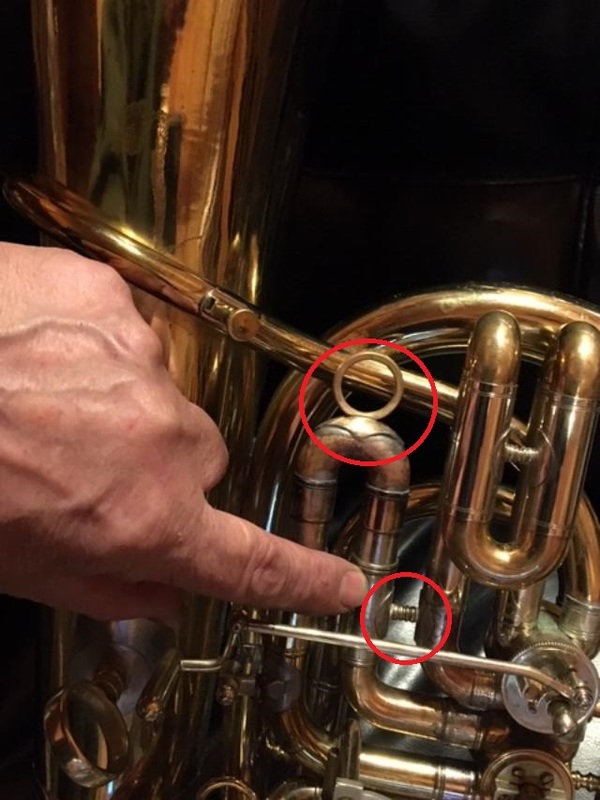 Though the Wick is a shorter mouthpiece, it offers lower pitch...and though the Wick mouthpiece might barely offer a more tuba-like sound, it's considerably more work to play (would require daily practicing, etc.) I'm keeping both 'pieces in the case for now. I'm thinking that this will epically improve playing position, and - thus - will also epically improve my performance on the instrument. Currently, I'm cradling it; the angle at which it is cradled is not ideal, and causes tension (fatigue...which can be heard in my recording). I'm going to consider replacing this recording with another one - once the floor peg is installed, and once I've learned a bit more about this recording device...but I promised a recording, so there it is. 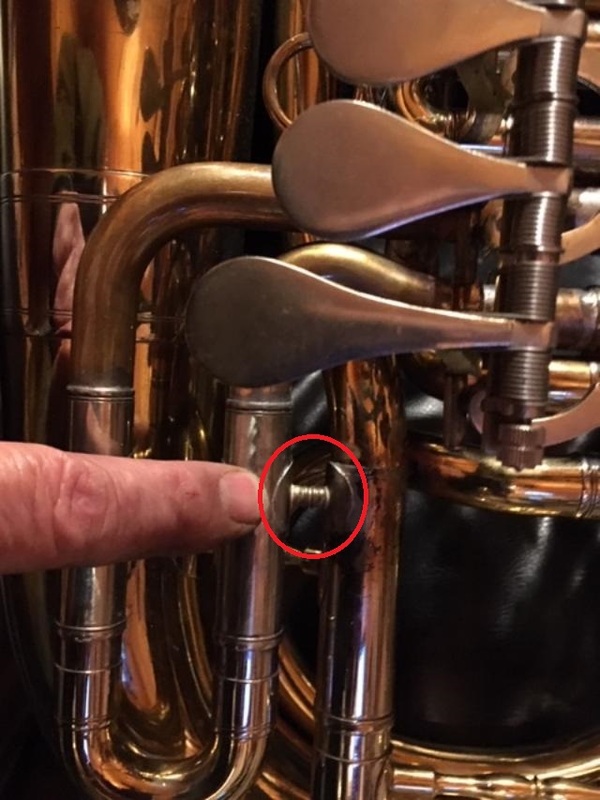 Your comment about the chair peg mimics my experience with the Miraphone 56A I owned. I really needed a peg to get it high enough to play. I also adopted the cradling method, which also allowed me to reach the main slide. Fortunately, it sounds like the intonation is better on yours. djwpe wrote: Your comment about the chair peg mimics my experience with the Miraphone 56A I owned. I really needed a peg to get it high enough to play. I also adopted the cradling method, which also allowed me to reach the main slide. Fortunately, it sounds like the intonation is better on yours. I've ordered a half-dozen of those nickel silver sheet metal disks from that "Thunderbird" jewelry supply place (link posted a couple of weeks ago). That gives me four chances to FUBAR two sliding brackets. The stainless steel peg and hollow tubing will probably come from McMaster/Carr. Some geometric considerations (as always) will be required. Such an interesting sounding instrument! Pretty close to what I imagined. 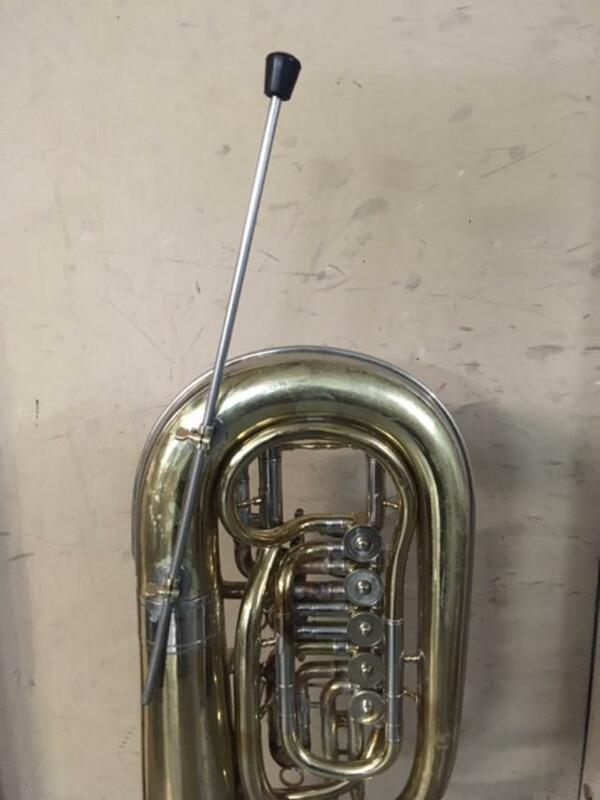 I'd love to try a horn like this out sometime. ...I avoided "sound enhancing" room reverberation...' might have cloaked some of my not-a-"bariton"-player weaknesses. ...and intentionally avoided the use of "viibrahhtoohh" as well. A very generous friend gave me the recorder. It's easy to use, but the seemingly limitless options/settings and (again) subtleties of recording are the things that I'll need to learn (along with "how to play the "bariton"). Seriously...I put great hope in the peg (playing position issues). I'm glad the recording was of interest. Again, I'll try to replace it later when the instrument is a bit easier to hold/play, and when my own skills have, perhaps, crept up to the next level. 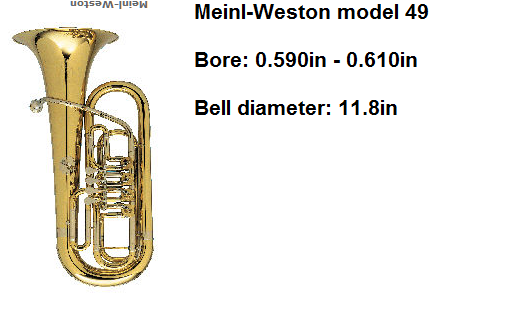 The baritone tuba (Spanish baritone) [Model 151] was originally the preference of Spanish Banda musicians. 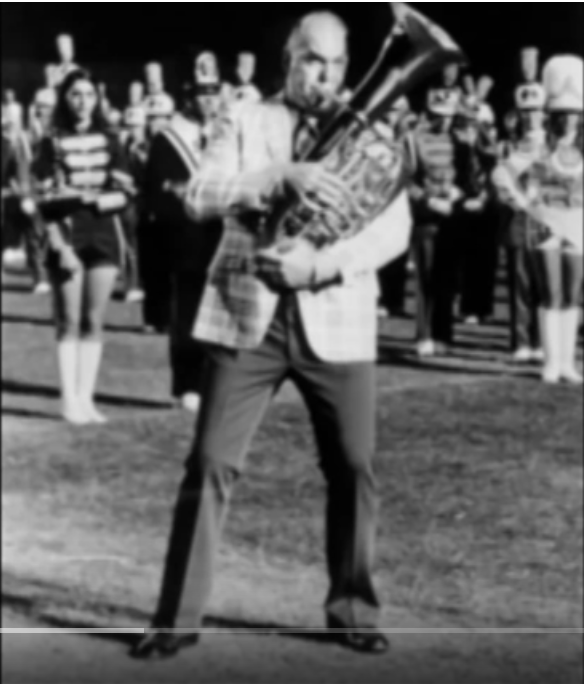 Since then the baritone tuba has proven itself a worthwhile substitute for the euphonium. 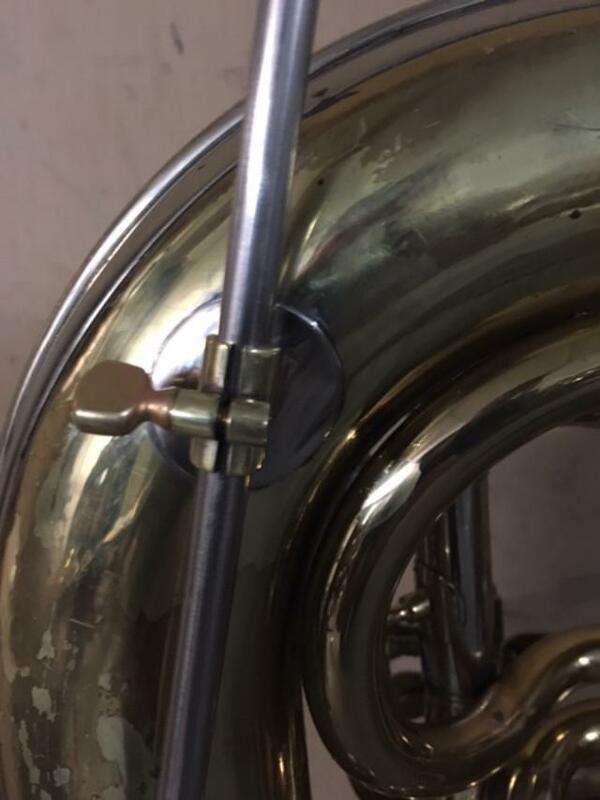 The bore of the tubing is taken from the baritone, but the expansion of bell branch and bell is much more pronounced. Upon special request the instrument can be manufactured with an auxiliary valve. A toy arrived from Deutschland, today. installed (read: committed) and discovered that the female M5 threads in the base are crap. ...so I wrote a politely-yet-tersely-worded letter to the German supplier of the adjustable thumb ring assembly. tapped a nice M5 thread into...buffing dirt ...so - once the buffing dirt was cleaned out (by moi) - there really were no female threads. It was NOT Miraphone. 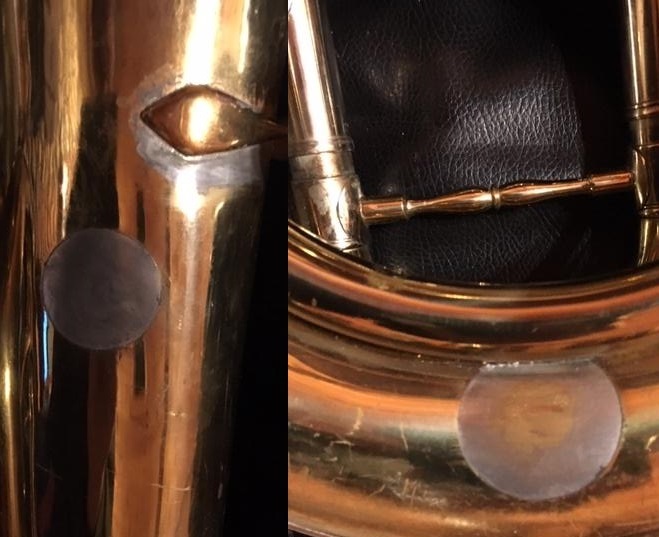 Miraphone has NEVER sent me ANY defective parts...and NEITHER was it Buffet. ...so (thus committed) I'm going to have to step up to an M6 thread, which means ordering some 6mm nickel silver rod, and (as this size is larger than typical band instrument applications) an M6 x 1 tap (flat end) and die. I guess one can buy crap from just about anywhere, these days.
' heading towards the finish line with this job. I'm waiting for a couple of cheapie 6mm thread taps to arrive. It sounds really nice on "Canzona per Sonare No. 4", just fwiw, and reminds me of some of the sounds I heard on the (monumental Philadelphia/Cleveland/Chicago) Gabrieli l.p. that was released in 1969. *Come see bloke play a custom left-handed tuba !!! To be fair, this is the ONLY place that I've seen this picture reversed. As soon as the 6mm tap arrives, I'll be taking this to the mechanical (but not cosmetic) finish line. 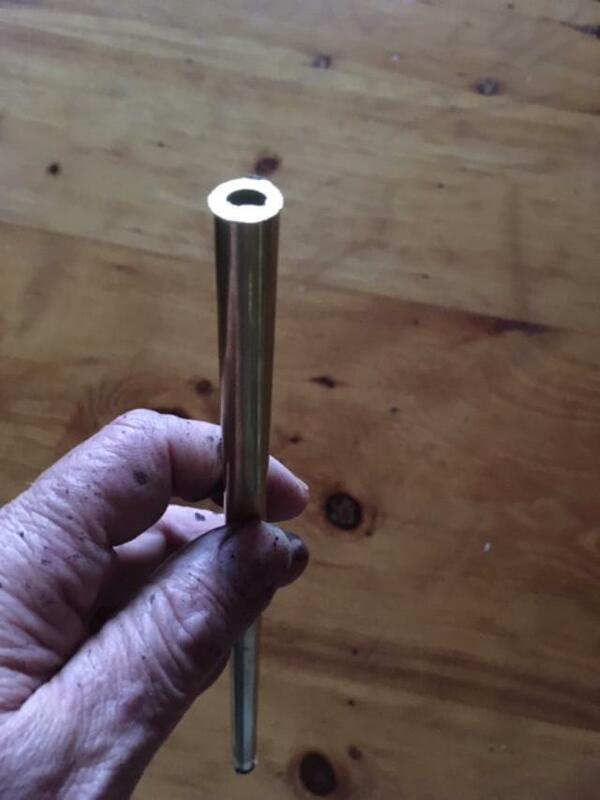 Here is some heavy-wall brass tubing (7/16" o.d., and nearly 5/16" i.d.) from which I will cut two 3/4"-long pieces to support an angled 5/16" solid stainless steel rod (with a rubber foot) to rest on my chair seat when I play. It should hold it right up in playing position for me. 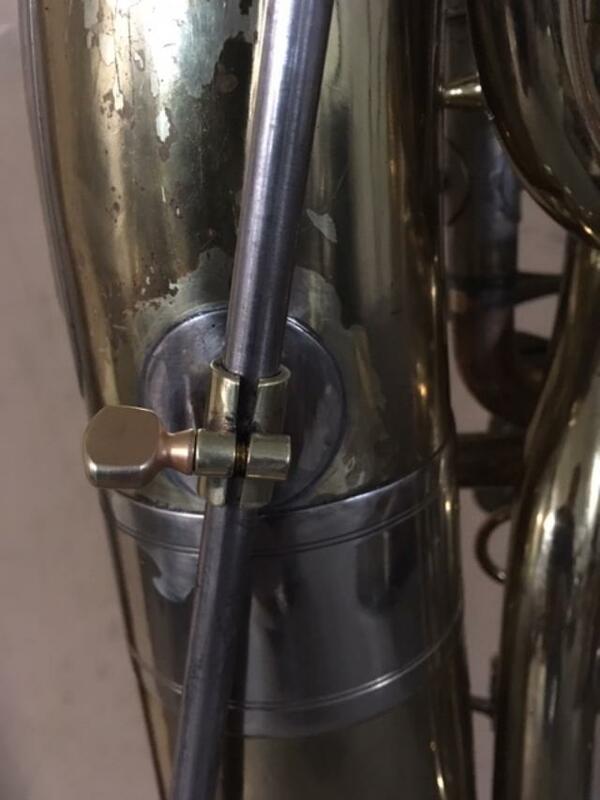 A friend (early in the thread) suggested a manufactured/for-sale appliance with a spring in it, but I really don't need to to be springy - just as I don't need my cimbasso (which has two solid floor pegs) to be springy. 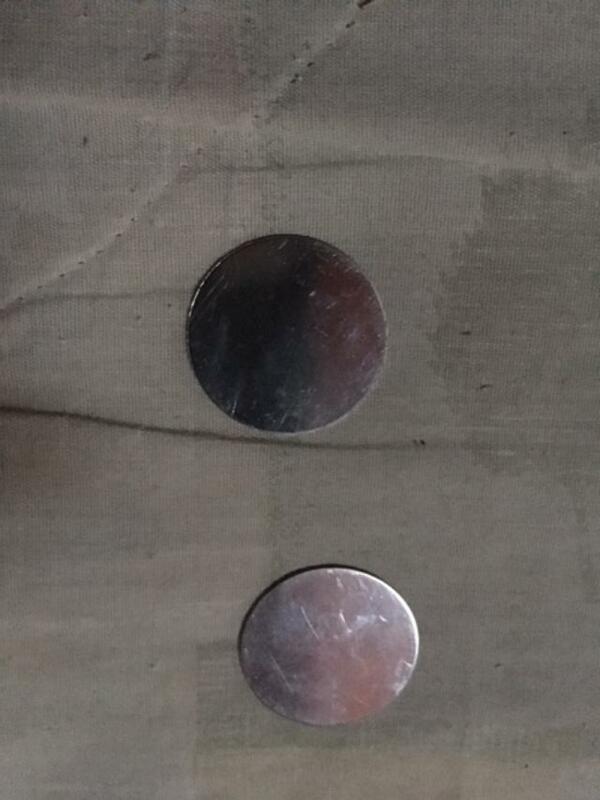 The nickel silver discs are typical band-instrument sheet metal thickness, and are 1-1/4" in diameter. Those will serve as the lead-soldered-to-the-back-of-the-bottom-bow flanges for these tension supports (silver brazed to the 3/4" long pieces of hollow tubing, which will be cut lengthwise, and to which tension screw assemblies - such as sax/sousa neck screws) will be brazed. It will be plenty strong, plenty simple, and plenty functional. 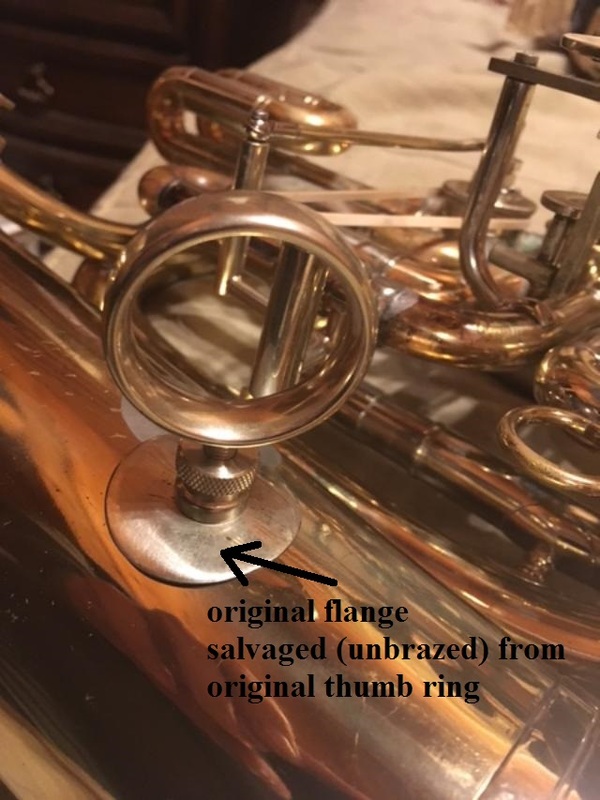 Otherwise, there are two braces to install (thank-you from Miraphone), an adjustable thumb ring to re-thread (larger threads), a 5th lever spring to install, and a #1 slide bow pull ring to solder in place. 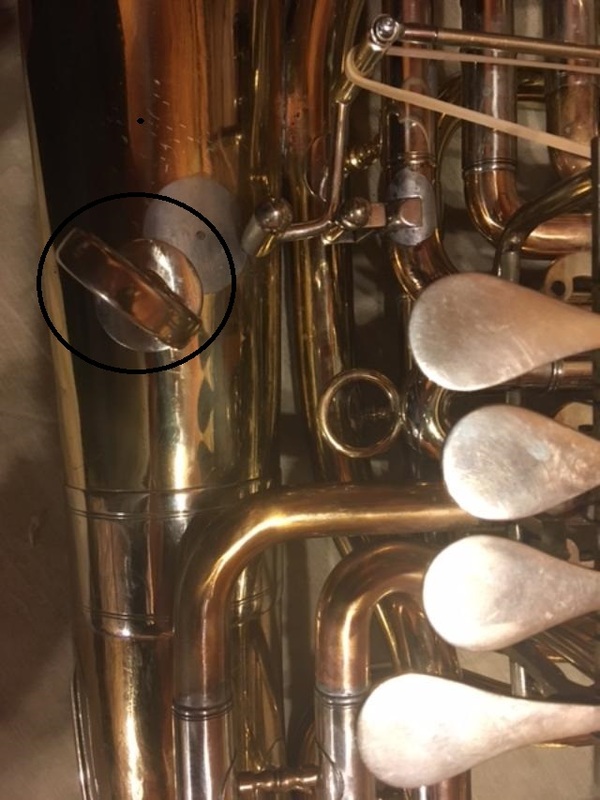 Should this instrument be silver plated, or re-lacquered? bloke "That's a bit of dripped black spray paint on my hand - from repainting a black mute." It's been two weeks since it was mailed by the seller, but it appears that my needed M6 x 1.0 thread tap will arrive today via USPS. This is to rebuild the crap (yet handsome) adjustable thumb ring that I bought from a European music store. To be fair, they DID give me a full refund, even though I only asked for a 50% refund. I REALLY would like to finish (at least the nuts-and-bolts portion of) this project. "Projects involving stuff that I fix up to keep for myself" (ok...and neither "stuff that I'm fixing up to flip") don't need to drag on forever. The M6x1.0 tap finally arrived today, so I went ahead and did everything...except for the chair-rest hardware. Things circled in red are new as of today. If I don't doze off, I may (??) go back out and fabricate/install the chair-rest peg supports. 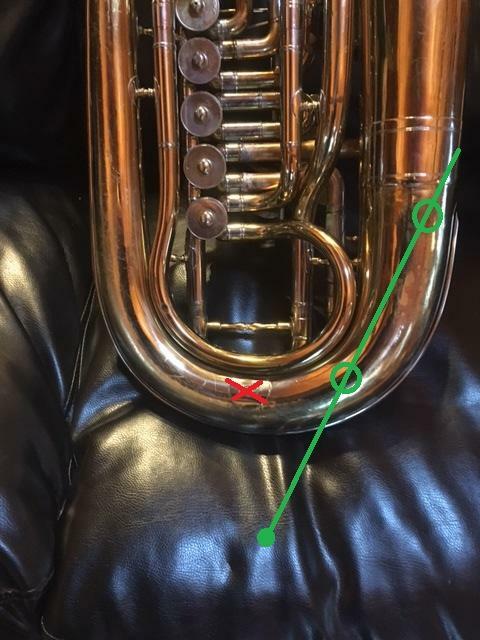 In defense of the term "euphonium" that ypu are denying this instrument, that name is not English in origin: that term was coined by a German maker - and the inventor - and adopted later by other manufacturers. The one anomaly is the spelling: "euphonion." The euphonium is a German invention. That's cool info. I never remember that these were/are (in my lifetime) never advertised a "euphoniums" by Melton or Alexander, but as "baritons". I suspect that Americans enjoy embracing the word, "euphonium" whenever they can, just as Americans generally seem to view most Latin-sounding words as being on a higher plane. 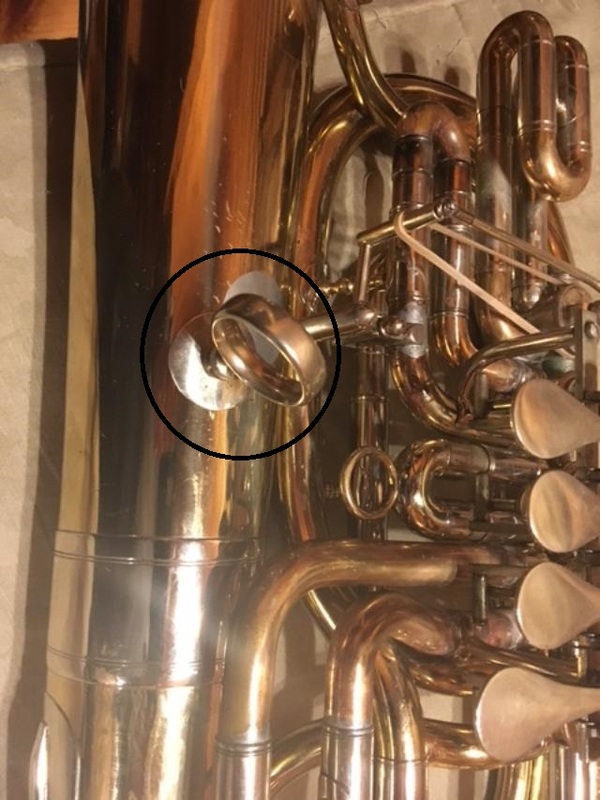 You and I both recall that - when Conn souped up their bell-front baritone with an extra bell - it suddenly became a "euphonium". ...and (as we will both remember) academia eventually rejected "Tubaists Universal Brotherhood Association" (T.U.B.A.) in favor of "International Tuba Euphonium Association" (which, unfortunately, is also the acronym for several other organizations). 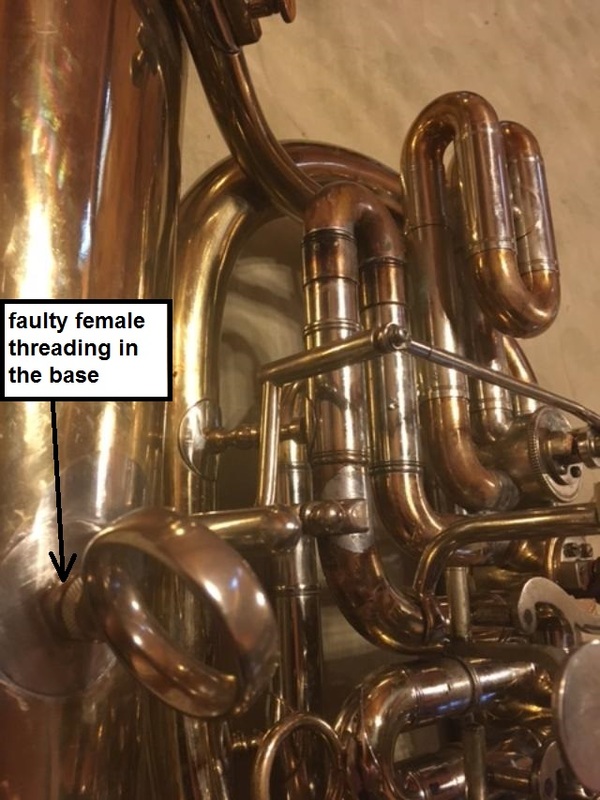 The things sold to Spanish bandas these days (special order from Melton...very difficult to find online, but can be found...model 49) are - as can clearly be seen in a picture - simply compensating euphonium bodies with rotary valvesets pasted on to them. My instrument, clearly, is not that. ...a bunch of hours (and a bunch of stupid geometry...none of which can be measured) to put this contraption in place. With all due respect to Dee Stewart (as well as the springy newfangled gadget people), THIS is WHAT I want, and this is ALL I want. It works QUITE well, and takes up NO space...The (removed) rod tucks under some of the plush in the case. OK...Other than re-lacquering sometime - and removing the last/tiniest peck dents and surface fluff - I guess I will label this project ~DONE~. I've looked back over all of the bracing that I recently added. I'm starting to think that Christian Niedermaier (who politely suggested that it could be more than necessary) may (??) have been right...but the thing is titanic, and there's nothing, now, which flops in the breeze or that relies (only) on an inserted slide to reinforce it. Now that I'm really oiling it up and practicing the two pieces (Gabrieli and Handel) with which I'll be using this instrument on a quintet recital next Sunday, the valves are barely beginning to stick...so the decades-old crap inside is obviously loosening up, which means that I'll be pulling the rotors and cleaning up the interior (probably not chemically, if I can avoid it). The new springs I found in the USA fit, but are very snug (barely too much width in the windings, which causes slight undue friction in the action). I found these in Germany, and just paid for them today. Their given measurements indicate an ideal fit. Their website says they only ship to Germany and two adjacent countries, so I emailed them and asked them to please ship to me, and to send me a PayPal link to show that they would be willing to do so (as their website insists on choosing one of those three countries)...so I'm hoping for improved rotor speed with them, once received and installed. ...The diameter of the wire on these bought-not-yet-received-springs is reported to be 8/10 mm. and the number of windings per side is eleven. The arithmetic indicates that the windings - on each side - will require 8.8mm of space. 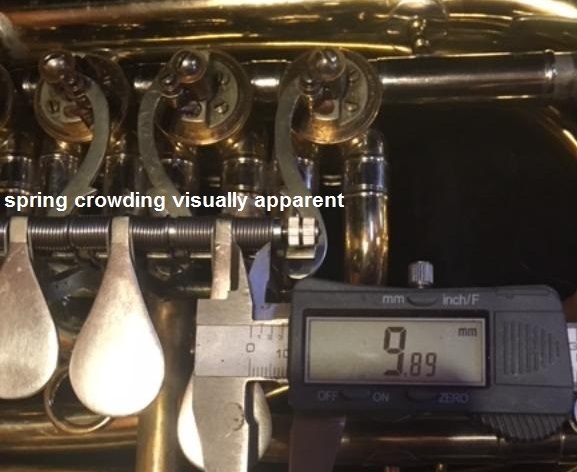 (rather than crowding the 10mm space badly) will have a subtle amount of "breathing room". Again, I'm hoping that the friction I'm feeling (due to the ends of the spring winding coils pushing very hard against the finger paddle attaching joints and against the linkage lever saddle brackets...and perhaps rubbing in the middle as well - due to bowing) will be eliminated. ...and yeah, as tightly as these USA-bought springs fit, it was a chore to install them. I REALLY appreciate Christian Neidermaier's (Miraphone boss) help with this project. 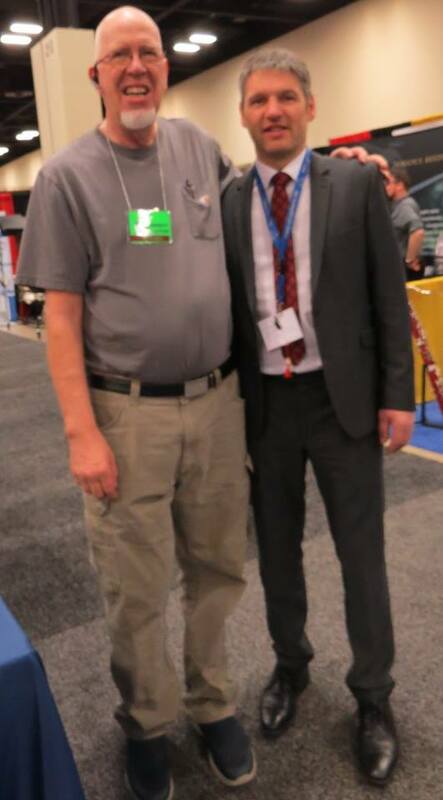 What a nice man, and a nice group of people...particularly taking time away from production to help people like me with our silly little projects. (He actually hand-carried parts needed for this project to TMEA, and handed them off to my daughter! ) When I contact Miraphone about purchasing parts, I ask once, and wait. When they have time, they respond. Even the parts listings and prices that they send - pre-shipment - obviously take up at least an hour of someone's time. I'm calling up the company and giving them a piece of my mind !!! Anyway, they are SLIGHTLY better. I continued to notice a bit of an inconsistency (#4 - best, #1 second best, #'s 2 and 3 stiff). > so it will look more "professional"
Last edited by bloke on Wed Apr 17, 2019 8:22 pm, edited 2 times in total.